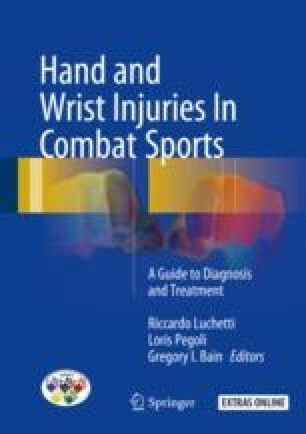 Injury to the metacarpophalangeal joints (MCP) and surrounding soft tissues is prevalent in a variety of combat sports where the closed fist is used to strike, with trauma usually sustained via an axial impaction mechanism . Conversely, sports which involve frequent grappling can lead to injury through a twisting or shearing mechanism to the MCP joint. Surprisingly little has been written on the subject, with most articles emphasizing injury to dorsal capsule (boxer’s knuckle) . Regardless of the mechanism, the fighting athlete uses hands and/or feet to deliver a blow or defend themselves, and one must be full acquainted with the type of injuries, however occult, that might be sustained and can limit or even end their competitive career. The arthroscope can help identify these injuries, however minor when intra-articular, and also offer definitive treatment in one minimally invasive procedure.